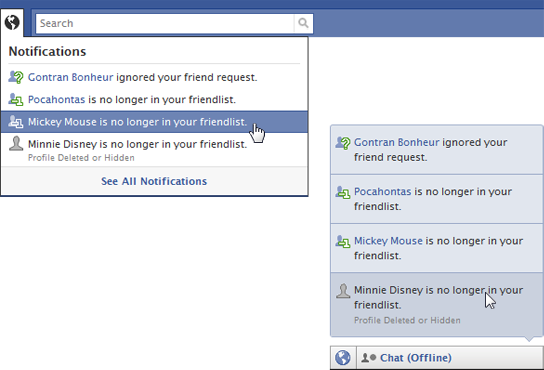 Want to get an alert when someone removes you from their friends list on Facebook? Use a simple GreaseMonkey script and be updated on the friends who don’t like you anymore. There are quite a few scammy Facebook applications that promises to alert you when someone unfriends, but they are fake and bogus. The terms and conditions of Facebook do not allow any application to monitor friends list of a profile. Due to the terms and conditions of Facebook, friend tracking applications are possible only with external scripts like GreaseMonkey. Unfriend Finder is a popular GreaseMonkey script that monitors your friends and generates unfriend alerts right inside your Facebook. Installation of the script is very easy and it’s supported on all the modern browsers: Firefox, Chrome, Opera and Safari. (Sorry IE guys, for many reasons you are left out always). After installation, you will see a new menu “Unfriends” on the top right side of Facebook. Clicking on the menu immediately after installation may not show you anything as it just started to monitor your friends. But from now onwards if someone removes you from their friends list, a notification is displayed. Along with unfriend notifications, this script also tracks and notifies the users who ignore friend requests. This is a cool script that breaches privacy of your friends and provides you some insights on your real social circle.